Two fine shows this evening . 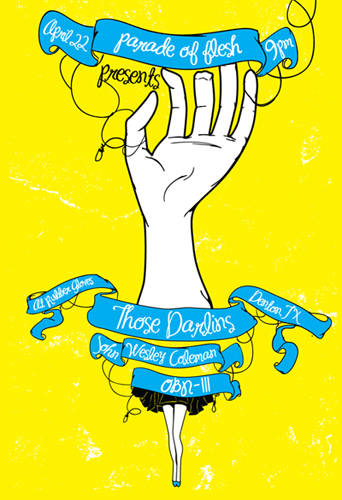 . . early show at Good Records with THOU and Big Fiction and then later in Dentron at Rubber Gloves with Those Darlins, John Wesley Coleman and OBN-IIIs. THOSE DARLINS are coming back through town to promote their newest album, Screws Get Loose(oh wow dang). Since I have hosted them multiple times in Dallas (Doublewide, City Tavern and Sons of Hermann Hall), this one is going to Denton. Therefore I managed to arrange a special gig with Texas rock’n’roll bands JOHN WESLEY COLEMAN (goner records) and OBN-III, which features Orville from Bad Sports and ex-strange boys’ drummer, Matt Hammer; both Matt and Orville are JWC’s backing band now. This entry was posted on April 22, 2011 at 12:22 am, filed under News.